It's not always easy to find attractive, knee-length dresses. 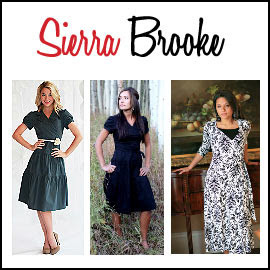 Sierra Brooke aims to provide "modest, yet trendy" women's clothing, and their collections of knee-length dresses are impressive. At the time of our visit to the site, most of the dresses were priced below $100, and there were many from which to choose. Styles include a "fun printed v- neck matte jersey dress," a "sleek v- neck faux wrap dress with chiffon trim," and many more. Some of the dresses seem to be the same styles that are presented on the JenClothing.com site, which we featured earlier on this blog.